SEMPERTHREE is a growing PS3 information resource, dedicated to covering all consumer functions of the Playstation 3 hardware. 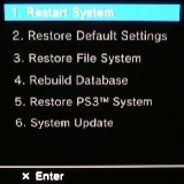 In addition to providing comprehensive information about repairs, troubleshooting, upgrades and all technical aspects of the Playstation 3, this site serves as a companion guide for owners of all kinds, whether you're looking to expand your console into a full media center or just trying to get the most out of your gaming experience. SEMPERTHREE latest News, Articles and Info. Hard Drive Upgrades - Not only is the internal hard drive upgradeable and expandable, but the system can be connected to external or networked drives as well. PS3 Error Codes - Having system errors with your Playstation 3? Check our comprehensive list of system error messages for their meanings and our recommendations. Compatible USB Devices - Many PC accessories can be used to great effect on your console. Find out what devices you can use to your advantage. Video Output Settings & Issues - Find your optimum video settings or resolve video output problems when switching to different screens or monitors. Repair - Determine if your disc-read issues are hardware or software related, learn how to repair YLOD (yellow light of death) and many other issues with the your console.